SAO PAULO/BRASILIA (Reuters) - A proposal by Brazil's next president to relocate its embassy in Israel, following U.S. President Donald Trump's lead, may set off a diplomatic storm in the Muslim world, threatening a key market for the world's largest meat companies. Brazil exports $16 billion (£12.2 billion) annually to the Middle East and Turkey, with just 3 percent going to Israel, according to government statistics. More than a quarter of Brazil's exports to the region are meat. Both Brazil's JBS SA, the world's top beef producer, and BRF SA, the No. 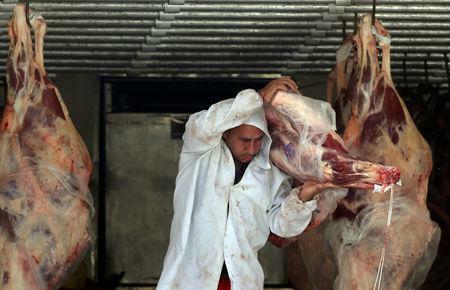 1 poultry exporter, have bet big on the growing demand for halal meat. Bolsonaro's proposal for the Israel embassy is part of his overhaul of Brazilian foreign policy, cosying up to major powers such as the United States and undoing what he calls leftist predecessors' alliances based on "ideological bias." Trump's decision to open an embassy in Jerusalem in May stirred a hornets' nest in the Middle East, and the United States had few allies follow suit. Guatemala did so in the days afterward while Paraguay has since reversed a similar decision. "We have a very important trade with Arab and halal markets," he told journalists. "We are confident that when a discussion of the matter involves the relevant areas — the farm, trade and foreign ministries — they will certainly reach the best solution."